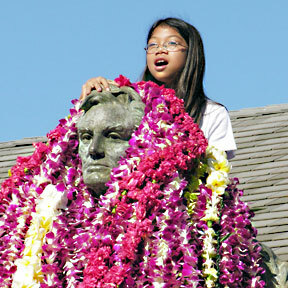 Tiana-Salinas Galeon draped leis yesterday onto the Abraham Lincoln statue fronting Ewa Elementary School. The school's annual ritual celebrates "Lincoln Day," the Feb. 12 birthday of the 16th president of the United States. The statue, dedicated in 1944, was funded by Katherine McIntosh Burke, a former school principal who admired Lincoln. The nationwide Presidents Day holiday will be observed on Feb. 21.